In view of P5 oral exams on Friday, 23 Sep 2016, CCA will have to be cancelled. 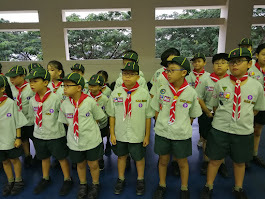 Initially the CCA teachers wanted to carry on with the younger cubs, but we discussed and felt that we may disturb the P5 pupils having their exams, so we decided to cancel the CCA in the end. Due to all the school activities and holidays, we will have only 1 CCA in term 4. Promise that it will be a memorable one! Keep a look out for any announcements that will be made for you to come collect consent forms from us. In the meantime, stay healthy and work hard!